Fine Dining in the Old Salzburg Restaurant; come enjoy delicious Austrian or Continental dishes, fabulous desserts, and incredible service. 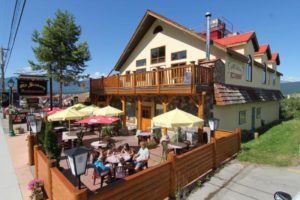 The Old Salzburg Restaurant in Radium Hot Springs with its warm atmosphere, highest quality food and well trained staff will make your meal an enjoyable one. The warm and cozy atmosphere and wonderful Austrian style decor makes dining at the Old Salzburg a true experience. You may choose from a variety of Schnitzels, Steaks, Homemade Spaetztle (pasta), Salads, Seafood, and mouth watering desserts. The Old Salzburg Restaurant also offers a great selection of Canadian and International wines. Join us for lunch on our outside patio. We are offering new daily lunch and dinner specials. Click to download our complete menu in a printable pdf format. If you are planning a wedding, a party or are in need for a facility for a large group of people, the “Attic” is for you. Our Attic with a more casual atmosphere, was added upstairs of the Old Salzburg Restaurant in 1997. Many fun and memorable events have taken place since then. Open 7 days a week; from 5:00pm-9:30pm.